Compliance is a big issue in human resources. There are so many different laws involved in work and employment that sometimes it’s hard to keep track of them all. In this article, we’ll go over different types of laws that you need to understand so your human resources department can act within the bounds of the law. Chefs need to understand health codes to keep people safe. Doctors need to understand HIPAA laws to protect their patients’ information. Broadcasters need to understand FCC regulations. The fact is some jobs entail following specific laws. Human resources is just one of those fields that has special laws that regulate the industry. Different HR positions are responsible for different tasks. Some may focus on employee development while others focus on compensation and benefits. But no matter what, each of these positions needs to understand what the law requires of them in relation to the people who they work with. Here are different areas of law that HR professionals should understand. If you work in human resources, you have to know about Equal Employment Opportunity laws. These EEO laws deal with discrimination with regards to race, gender, nationality, religion, age, disability and a variety of other factors. EEO laws matter during the hiring process all the way to when an employee is let go. In fact, HR professionals shouldn’t be the only ones who understand EEO laws. Everyone in the company should know how to comply with these laws to one degree or another. This is especially true considering how much pressure companies can feel to comply with these nondiscrimination laws. Regular trainings and reminders to stay compliant will not only protect employees from being discriminated against, but it will also protect the company from the actions of misguided or uninformed employees. The US Department of Labor regulates wages and work hours. The most important laws to understand that deal with wages and work hours are the Family and Medical Leave Act (FMLA) and the Fair Labor Standards Act (FLSA.) These two are what give employees their 40-hour work weeks and their 12 weeks of unpaid leave. But they also regulate about overtime pay and child labor laws. The Affordable Care Act, Consolidated Omnibus Budget Reconciliation Act, Employee Retirement Income Security Act, and Health Insurance Portability and Accountability Act all qualify as employee benefit laws. These laws mostly deal with healthcare, retirement, and insurance. Basically, all of those benefit packages the company gives customers qualify as employee benefits. Workplace safety laws deal with the working situations of employees as well as compensation rights in case they are somehow injured while on the job. The most important law to be familiar with is the Occupational Safety and Health Act, also known as OSHA. These regulations also outline how America’s disability programs function. OSHA is governed by the US Department of Labor. Aside from Federal laws and regulations, you should be familiar with your state’s specific workplace safety laws. State laws can vary greatly from state to state and it’s important that you understand any and all extra regulations you may be asked to comply with. Workplace safety is immediately important for your company’s employees, but it is also important in the long-term for the company. Employee injuries cost money, slow down efficiency, and create a bad reputation which may make it difficult to hire top talent. Aside from this, providing a safe environment for your employees is simply the right thing to do. The most important law HR professionals should understand, that relates to immigration, is the Immigration and Nationality Act. The main focus of this act is to get employers to only hire eligible employees who are legally allowed to work in the country. This includes US citizens and immigrants with work permits or residency. Every employee will need an I-9 document on record to prove his or her residency. Immigration laws run parallel with workplace discrimination law, so make sure that you not only understand these two forms of law but how they fit together as well. As HR professionals, there’s a lot to learn. And, there’s a lot of documents that you’ll have to store to stay compliant. Staying compliant is a constant source of stress for HR professionals because they have to track every single document. But that’s not the case with eFileCabinet. 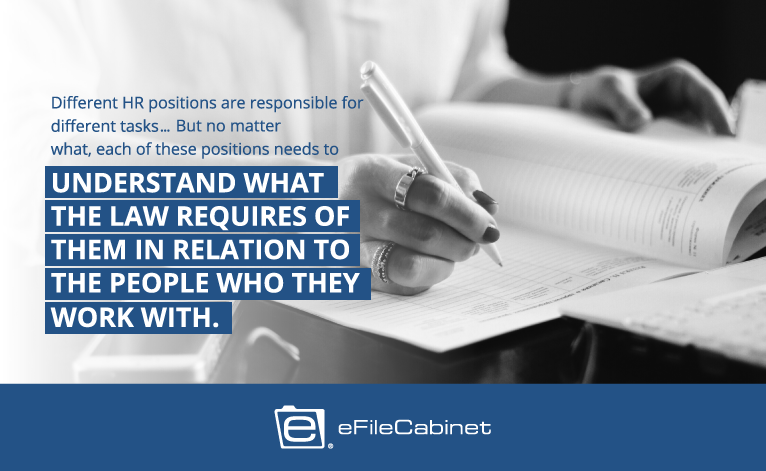 eFileCabinet lets you auto-populate forms like I-9s for every new employee. It can also let you set up permissions for who can access or manipulate documents. This is arguably one of the most important features for HR professionals. As long as the rules you set up are compliant with the law, you’ll never have to think about it again. 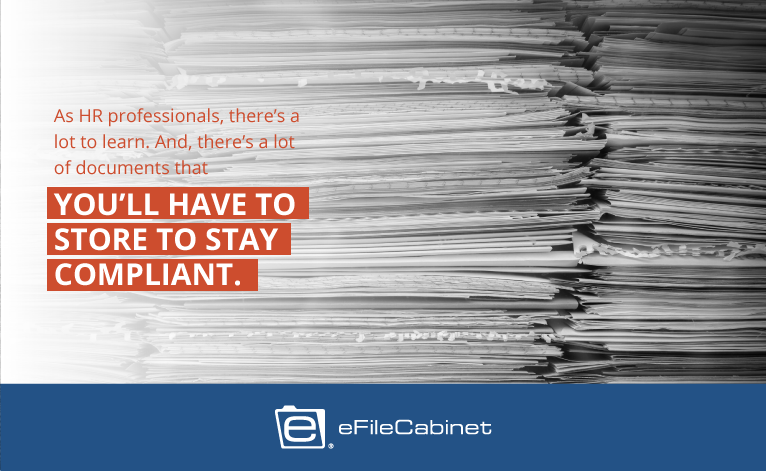 eFileCabinet will keep everything compliant for you. 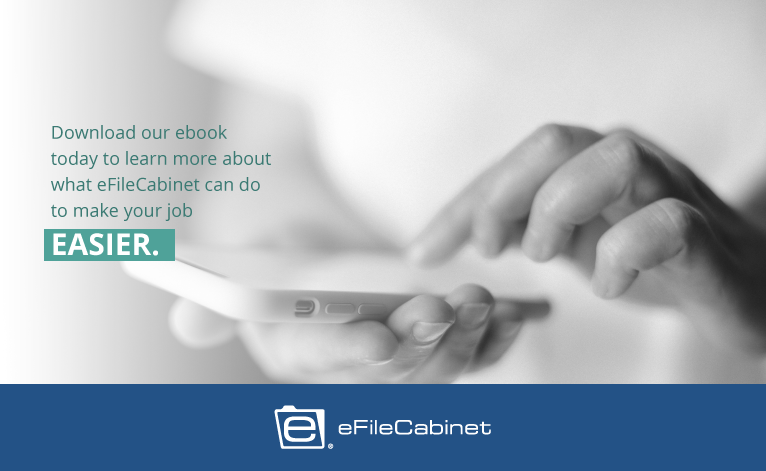 Download our ebook today to learn more about what eFileCabinet can do to make your job easier.